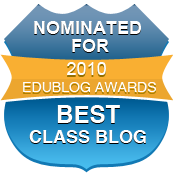 I’m very excited to announce that our class blog has been nominated for the prestigious EduBlog Award in the category of Best Class Blog. Please take a moment to vote for our class blog. The purpose of the Edublog awards is to promote and demonstrate the educational values of these social media.